SIMPSON’s DONKEY is a Rannoch R20 built in 2016. She is currently based in the south of Australia and would be ideal for a Solo or Pair considering an Indian Ocean crossing as she is already in Australia. – 9 foot Para anchor with varying length deployment and retrieval lines. And… it’s official… Axe, Luke and Simpson’s Donkey are safely back on land at the holiday town of Mallacoota, a little south of Eden where their journey began. Met by Luke’s parents with a boat trailer, all has ended well with some awesome seamanship to get Simpson’s Donkey back safely without having to trouble any emergency services. While it’s not the landfall in Mew Zealand that they’d hoped for, nevertheless, a small battle was won in that the guys were able to make it back without help. “It was a massive effort to reach Mallacoota this morning,” says Axe. “We had to fight currents all night and had to row two-up for the last six hours to make it into the boat ramp under our own steam. More to come from Axe once he’s regained his land-legs! 9pm update – land has been sighted! Just 18 nautical miles to go – close enough to send a photo via phone – and spirits are high aboard Simpson’s Donkey! “You can see land over Luke’s shoulder- I just wish it was NZ,” says Axe. Firstly the status – Axe, Luke and Simpson’s Donkey are all safe and making great progress back towards the Australian mainland. Last night, as you’ll see from the tracker, the course detoured south just a little bit while the guys waited out some adverse winds on parachute anchor. But this morning at about 2am the winds changed again and Axe and Luke were able to start making a northerly course again. 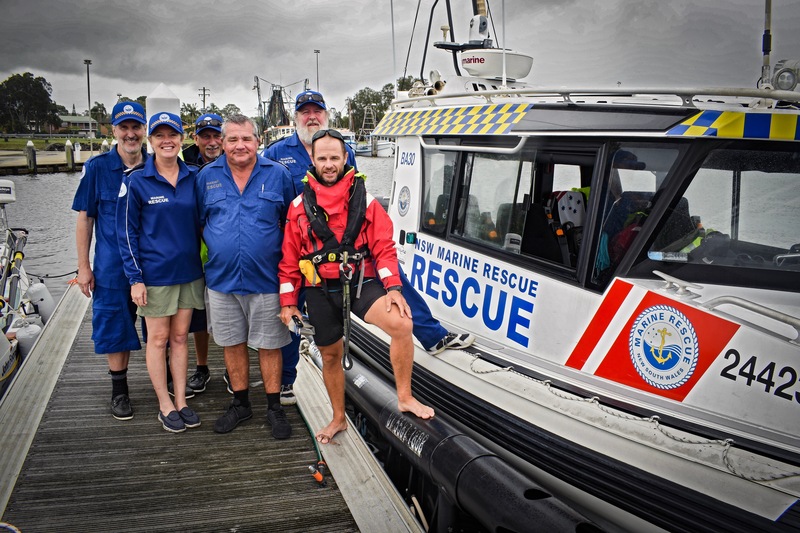 So far today it’s all gone well and currently they’re making a course for the beachside holiday town of Mallacoota where Axe has already been in touch with the locals by satellite phone to organise a trailer for their arrival at the boat ramp. So all going well, Axe says that they’ll make it to Mallacoota sometime around dawn tomorrow morning – Sunday 18 November. Keep in mind though that while it’s all looking good at the moment, as Axe has said throughout this expedition, bringing Simpson’s Donkey into land is always a tricky and potentially dangerous operation, so the guys won’t be relaxing until their toes are in the sand at Mallacoota and Simpson’s Donkey is on the trailer. As always – keep the messages of support coming! They’re almost home – com’on the Donkey! So the latest from on board Simpson’s Donkey as of this morning, is that all is going well in Mission: Get home safe. “Conditions last night were ideal for rowing,” says Axe. “We rowed 2-hour shifts all night and have been doing 1-hour shifts so far today. “Today the wind is swinging to the North-East which will slow our progress a little but our meteorologist Roger ‘Clouds’ Badham is doing an amazing job. We’re very lucky to have him guiding us with such accurate and vital weather information. He’s been feeding us information twice daily, and without his support and expertise we would not be able to make it back. In the longer term, the winds are expected to be more favourable tomorrow, so fingers crossed the guys can make some good progress back to safety. Speaking via Satellite phone this morning, Axe said that after a rather brutal capsize on Tuesday, both he and Luke have decided that it is not safe to continue and they’ve made the decision to turn Simpson’s Donkey around and head back to Australia. The capsize, according to Axe, came via a rather large wave which threatened to pitch-pole the boat. Pitch-poling is a worst case scenario when the boat is tipped end-over-end rather than a normal, vanilla-flavoured capsize which tips the boat over sideways. The event underlined just how fickle luck is on the Tasman… and how much of that luck is needed to cross it. While the capsize is not unexpected – Axe is now a veteran of numerous capsizes after two previous attempts at crossing the Tasman in Simpson’s Donkey – Axe did say that he’d hoped that by having two people aboard, that they could avoid capsizes. This, he said, was because with two people on board, they’d be able to have someone on deck 24 hours a day steering the boat with the swell to avoid tipping over. However this doesn’t seem to have worked and it’s become apparent that while Simpson’s Donkey is a fantastic craft in the more predictable Atlantic Ocean, it struggles in the swirling, temperamental and unpredictable Tasman. And so with still so far to go and without the confidence that both Axe and Luke will be safe, the decision has been made to turn back before something much worse happens. Axe also mentioned that Luke, who has previously crossed the Atlantic in a similar rowing boat, has commented that the Tasman Sea is a much wilder and dangerous beast than what he had experienced on the Atlantic. So now you will notice by looking at the GPS tracker that Axe and Luke have turned the boat around and are currently working overtime to get the boat into position for a predicted change of winds that will push them back towards the Australian mainland. And over the next few days the guys are going to row as hard as they can to make it back to safety without having to abandon the boat out there. Messages of support have a great effect in situations like these, so if you’ve got some positive words to say, please do leave them below and we’ll pass them on. The stage is set for the round 3 battle with the Tasman Sea to begin. Within the next few days I will depart Australia once again in my third attempt to finish off the Rowing from Home to Home expedition, a journey from Singapore to New Zealand completely by human power. I have currently travelled for 164 days covering 11,700km since leaving Singapore on the 3rd January 2017. I have made 2 solo attempts to finish the expedition with the final stage of crossing the Tasman Sea from Australia to New Zealand. The first a 24 day 2,200km effort last year which ended when I was washed back into the coast of Australia further away from New Zealand than where I departed! The second attempt was in August and October this year which I aborted on day four due to some critical equipment breaking onboard and I was subsequently picked up by helicopter. I have made a number of changes to the plan for round 3. Strengthening the boat in key areas, changing the para anchor set-up, waiting for slightly warmer temperatures and also bringing a second ‘engine’ in the form of Luke Richmond onboard as a team mate. I have known Luke for sometime, and with his previous adventure track record and experience level, the fact that like me he is a ‘back country boy’, and coupled with his ability to join at very short notice, I am very privileged to have him onboard – let’s see if he feels the same way at the end of the journey! You can read more about Luke here. I thought long and hard about this decision, and even though I very much still want to make the crossing solo, I believe having a second rower in my boat will increase the probability of success by around 20%. And at this stage of the expedition, with the bigger goal in sight of completing the first human-powered journey from Singapore to New Zealand, and a team who have been extremely supportive and patient to date, I want to give everyone the best chance of finishing the expedition on the third attempt. And as a good friend told me recently – “Only donkey’s don’t change their minds”. Currently we are focussing on preparations, planning and risk protocols. Our departure will be very shortly, it will be as low-key as possible, and we will start updating more once out on the water. If you are interested to follow the progress – then updates will be posted through this website, in the form of written blogs and voice posts from the Satellite phone. The blogs will also be shared on the expedition facebook page here. You can also see our position in real-time, updated on a 10 minute basis from the MAP link above. In the meantime – please enjoy the artistic talent of Sarah Steenland who captured the second attempt’s failure and the plan for round 3 in such a beautiful, clever and humorous way! On the 30th August, 2018, I set-off from the port of Eden in South-East Australia, in a solo attempt to row across the Tasman Sea to New Zealand and finish the Rowing from Home to Home expedition. Rowing from Home to Home is a journey I am attempting to make from Singapore to New Zealand completely by human power. This was my second attempt at finishing the expedition, after a 24-day effort in October and November 2017 saw me turn back whilst 400km off the coast of mainland Australia due to adverse winds. Not once during those frustrating 24 days did I have favourable wind conditions to move me towards New Zealand and the success of any ocean rowing endeavour is at the mercy of the wind. During that 24 day period I had rowed a total distance of 1,100nm (over 2,000km) which is equivalent to the total length of a Tasman crossing but I had made a very large circuit which ended back in Australia in the small fishing port of Ballina – further away from New Zealand than where I had started from (Coffs Harbour). I then decided to re-strategise my departure point, route and timing of departure for a second attempt. I cycled for 13 days from Ballina, 1,300km down the east coast of Australia, through Sydney and over the iconic harbour bridge, all the way to the town of Eden in the south of Australia. Eden is a small fishing port located close to the border between Victoria and New South Wales. The reason for moving south was to get closer to the 40 degree latitude line or the roaring forties. There are basically two choices when rowing across the Tasman from Australia to New Zealand. The mid-Tasman route or the Southern Tasman route. There is considerable difference between the two routes. The mid-Tasman route departs from somewhere between Sydney and Coff’s Harbour, whilst the southern Tasman route is much lower, and departs from Tasmania or Eden. The water and air temperature is much colder on the southern route (water is around 12 – 13 degrees down south as opposed to 21 degrees higher up), the likelihood of gales is much higher and the sea-state is rougher. But, the wind has more of a westerly component in the south and it is a slightly shorter crossing to New Zealand. The weather systems down south come through much faster than they do in the mid-Tasman so even the gales generally don’t last more than 24 hours. Currents tends to be more of an issue on the mid-Tasman route, with more eddies to negotiate than further south. I planned to take advantage of the westerly winds in the southern Tasman route for my second attempt. Currently no one has successfully crossed the southern Tasman route all the way from Australia to New Zealand. I did not want the added pressure of media covering my departure with reporters hounding me for departure dates and times on a daily basis so I deliberately kept my details low-key and did not post updates on my website about my intentions. The local wharf in Eden had kindly allowed me to tie up for free however their rules required me to sleep on the boat. After eleven days and nights bumping away tied alongside (the jetty is not sheltered from southerly winds which often blow through), I set off on the 30 August, 2018. Strong westerly winds were forecast on the evening of day two which I intended to make full use of to help move me towards New Zealand. Day one started well, I rowed for nine hours straight to get away from land on a beautiful day with a light northerly breeze. I was accompanied by pods of dolphins and two large whales. By darkness that evening I was 20nm from Eden and 7nm offshore, having made use of a southerly setting current to move generally south-east. I knew I would be passing through the busy shipping lanes later that evening which are 10nm – 20nm offshore. This was a night with no sleep, and saw me on the radio, communicating with vessels throughout the night to ensure we kept safe passing distances. My experience in the first attempt in the shipping lanes for 6 days and nights was very useful. The wind was starting to increase now and with occasional rain and poor visibility, the SIMRAD AIS (Automatic Identification System) and VHF radio worked beautifully and was critical to our safety through the night. Five massive vessels at over 200m in length and travelling at 15 knots passed within 1nm of Simpson’s Donkey with the closest steel giant only 800m off our stern. The crew of these vessels without exception, proved professional, vigilant and the cooperation was straight forward as we chatted over the radio to ensure everyone was safely passing. On the radio in the cabin during the 1st night. By the morning of day two we were out of the shipping lanes and still moving south-east at around two knots. The wind picked up all day as we bumped along, and I was aiming to get to 38 degrees south before turning east to New Zealand. Gale force winds were forecast to hit around 9PM that evening. I was both excited and apprehensive about the wind. Excited that it would be the first time in 26 days rowing on the Tasman that I finally had some decent wind blowing me towards New Zealand (‘free miles’ in ocean rowing terms), and apprehensive at how best to set the boat up to maximise and safely handle these conditions while still making miles. Even though the wind was going to be strong I was determined to utilise it to make as much ground as possible. I readied the boat in the twilight. and secured and strapped the deck down. At 9PM in the darkness, I engaged the small SIMRAD electric autopilot, set it on a heading due east and climbed into my sleeping bag in the cabin. As the wind picked up into the late evening and early hours of the morning, things worked to plan. We were being pushed along towards New Zealand with the autopilot keeping the boat straight and on a constant easterly heading. The sea-state grew during the night as the wind increased, and as it did the waves started to become more confused in their directions, with some starting to break. I was now close to the region just to the east of Bass Strait, a notoriously ‘bumpy’ part of the world. We were making great progress towards New Zealand, however at 4AM we were flipped over (rolled or capsized) by a breaking wave that came in from our port quarter. Now Simpson’s Donkey is designed to roll over and automatically self-right and indeed she functioned as designed, rolling back over in a few seconds and shaking the water off. I was thrown about in the cabin and enough water got in through the partially open air vent to wet my sleeping bag. I began adjusting the course on the autopilot to try to find the best heading to keep us from rolling again yet still make miles to New Zealand. However 1.5 hours later we got caught by another wave and were flipped again. We again rolled back up quickly, but I decided it was time to make come changes. Crawling out onto the back deck in the dim light of the early morning, I began to manually steer. This is where I sit on the deck with the steering lines in my hand facing the stern of the boat and the oncoming waves. This worked well, and I was able to quickly kick the heading of the boat around to ensure we were always lined up with the breaking waves. We were hitting 15 knots of speed as we surfed the breaking waves and it really was tremendously exhilarating and a lot of fun. Unfortunately the power of the waves hitting the back deck snapped in half two of my spare carbon fibre oars, which gives an indication of the force of the water. However sitting in the back deck was cold. Even though I was in my goretex drysuit with thermal sharkskin under-layers, without the effect of rowing to warm my body and with the water up to my chest at times when then the waves broke over the boat I was soon getting uncomfortably cold and knew this was not a long-term option. So I deployed my drogue (very small parachute, only 1 – 2 feet in diameter) off the stern to slow us down and stabilise the boat somewhat. All morning the sea state picked up and the sea really was very messy and we eventually rolled a third time. This time the boat took a little longer to self-right, around a minute or two before we slowly came back over. I believe the righting was affected by the drogue attached to the stern and/or due to the fact there was a little more water in the cabin that had snuck in through the vents. It was definitely a most interesting experience to be inside the cabin with the boat upside down, standing on the roof and looking out the back hatch when we were completely underwater – in effect the view out a submarine port hole. After some rocking back and forth while inside the cabin, combined with some favorable wave action she came back up again, the boat no worse for wear, but the rower now ready for a change of underpants! I finally decided I had been stubborn enough and it was time to sacrifice progress for stability and deployed the parachute anchor. The parachute anchor is a large 9-foot diameter underwater parachute which I deploy off a long line attached to a U-bolt mounted on the bow. The parachute holds the bow of the boat into the direction of the wind, which generally (although not always, especially on this route) is the direction from which the waves are coming from, and in effect allows us to ride out rough weather in the safest way possible. After a few hours bouncing away on para-anchor, with no more rolls and the situation under control, it was just a matter of waiting out the storm till the next morning before getting under way again. Unfortunately, in the early hours of the afternoon I heard a noise and felt the motion of the boat change. I knew instantly we were not on para anchor anymore. Clambering onto the back deck my suspicions were confirmed as I saw the para anchor was now held to the boat only by the small retrieval line (it should have been anchored to a solid U-bolt on the bow by the main deployment line). At this stage I was not sure why it was no longer attached to the bow however further investigation would require taking a swim and in these conditions that was out of the question (5m breaking waves from different directions and 35+knots of wind). So I pulled in a enough of the para anchor line to deploy it from the stern. This is not an ideal method to deploy the para anchor from on this boat, but it got us through the following night. By the morning of day four, the wind was back down to a manageable 20 – 25 knots, the sea had calmed down slightly and life was looking rosier. However upon pulling in the para anchor, I found fastened to the end of the rope the U-bolt that was meant to be solidly screwed into the bow. This was a very bad situation, the U-bolt is the single point on the bow where I secure the parachute anchor. It is a critical piece of equipment and is made from stainless steel with a 4000kg breaking strain. It had snapped completely off. There is no back-up bolt. At that very moment, life completely changed. The bolt in question in my hand, it snapped at the threads between my fingers. As I stood on the back deck and thought about the situation, it took me less than five minutes to come to the conclusion that I would not be continuing the row to New Zealand without a reliable way to para anchor. My options to para anchor now were reduced to rigging some form of bridal off some cleats on the side of the boat, or to deploy it from the stern. Neither of these options were safe long-term solutions (I had already ripped one of the side cleats completely out on the first attempt with the para anchor). Having just spent sometime underwater in an upside down boat, I also was concerned how it would affect the critical self righting of the boat if we flipped with the bridle system in place. On this particular route, not having a reliable way to para anchor so early on in the trip had now propelled me to a level of risk which I was not willing to accept. After discussions with project manager Dave Field, the call was made to abort the attempt and the decision now was whether I could make it back to Australia in time before the next gale hit under my own power. ‘Clouds’ – the expedition meteorologist predicted I would get close and that we had three days of good weather coming up, before the next northerly system would hit. But I would not get all the way in before needing to weather another potential northerly gale. With a well-functioning parachute anchor this would not be an issue, but without it, I was not prepared to accept this level of risk either. So the decision was made to use the three-day fair weather window to arrange a controlled and safe pick-up by a passing ship. After some phone calls with the Australian Maritime Search and Rescue who coordinate these pick-ups, they confirmed a vessel would be passing by within 12 hours. As I was in no immediate danger this was good news for me, however when the Search and Rescue machine kicks into action it is truly impressive and has a mind of its own. They asked me to standby for an hour whilst they made a plan before informing me they had made the decision to send a rescue helicopter instead of waiting for the vessel, which would arrive in around 2.5 hours time. With the excellent communications systems we had onboard (multiple tracking systems, sat phones, VHF radio and multiple epirb and plb beacons), the process went very smoothly and after lunch on day four I was picked up by a very competent and professional helicopter crew and flown back to the mainland. As we flew off, I said goodbye to the little Donkey, a boat I had now travelled and lived in for over 6,500km in the last two years. Within 5 hours of landing in Australia I was on the plane back to Singapore. My worldly possessions were my passport and credit card and some borrowed clothes the helicopter crew had kindly loaned me (plus a very wet drysuit). I could not sleep on the overnight flight back to Singapore. By this stage I had hardly slept for four nights and days but my mind raced as I went through the events that had unfolded the last four days, over and over again. What could I have done differently? Had I made the right decisions along the way? What did the future entail now? I did not at this stage know the answer to any of these. What I did know was that the expedition was now dead. I had lost my beloved donkey. There was no way I had the resources or the energy to get another boat and attempt this again. I had no insurance for the boat as I could find no one too insure her. Seven years of my life and so much effort and support from others had been invested in this project. Everything was a blur by the time I landed in Singapore in the early hours of the morning. Stephanie picked me up from the airport and I gabbled a stream of random, depressed and tired thoughts as we drove home. Once home, I quietly snuck into my daughter’s room and lay down on the mattress beside them. Rachel felt my presence and rolled over in the darkness, reaching her little hand out until it touched my hairy face. Feeling the whiskers it took her a few seconds to process who it was. “Dada!” she cried out in the darkness. Finally I could sleep. When I woke up later that afternoon with my thoughts clearer, I immediately began checking the position of Simpson’s Donkey. I had left the AIS running, so could track her exact location. Over the course of the next three days, with coordination and the expertise of weather guru Roger ‘Clouds’ Badham’s predictions of wind and current together with the Eden Marine Police, we saw she would be around 50 – 60km off the coast and there was small window of opportunity to tow her into shore before the strong winds hit. I have much gratitude for the people involved from the Australian Maritime Search and Rescue, to the helicopter crew – Pilot Bryce England, Air Crewman Darren Magor, Dr Gerrard Marmor and paramedic and swimmer Justin Hockley, absolute legends, your professionalism, empathy and support for what I am trying to do is hugely appreciated. Also the marine police in Eden and the Eden Marine rescue who all played their roles in coordinating my pick-up and the subsequent tow-in of Simpson’s Donkey. You are a credit to your service and what an asset to the Australian people and visitors to your shores. The people of Eden whom I have dealt have also been wonderfully supportive and I cannot thank them enough for their generosity of spirit. Eden is a fishing port with a long and proud seafaring history. It has been touching to see how people whose lives are formed and shaped around the sea, support fellow seafarers in their times of need. I will indeed pay their support forward. I have two options open to me. I could give up, put it into the ‘too hard bin’, move on with life and wake up every day for the rest of my life with regret. Or I can use what I have learnt and the experience gained to make another attempt. No one has successfully crossed this route – there is no manual to follow. At the end of the day I prepare the best I can and then there is nothing left but to get out there and have a crack. We are all only as strong as our weakest links. In this case an $18 bolt was the weak link in the chain. The same bolt which has been used and never yet failed on 60 other vessels which have successfully rowed across crossed the Pacific, the Indian and the Atlantic Oceans. But the Southern Tasman route does not seem to care about other oceans – she makes her own rules. Any weakness she pounces upon, rips wide open and lays bare. Simpson’s Donkey is being modified and strengthened in key areas and being prepared for another attempt at the Tasman in the not too distant future. I have never once lost the belief that I can cross the Tasman solo, safely and in record time. I also never chose this journey because I thought it would be easy, rather the opposite. To find such a challenge to finish off such an expedition somehow seems very fitting. It is a privilege to find something that tests me, pushes me to my limits and motivates me at the same time. I am very aware of the risks and the limits of how much I am prepared to accept. I will continue to make decisions which reflect this and as with the previous two attempts I would rather pull out before the situations get critical and live to fight another day. I have also learnt through this last attempt that I missed the blogging, writing and sharing of the journey a great deal. Writing this post has been a useful and cathartic process in helping me arrange my thoughts. I will resume my blogging and sharing the journey for attempt # 3 over the next few months. Bye for now and thanks for reading. For the final stage of the Tasman crossing I have teamed up with the talented French Stallion Mr Ludovic Tendron to support an issue affecting every human being. The tragedy of single use disposable plastic poisoning our oceans. And a call to action on the back: ‘DO YOUR PART’. I recently spent two weeks continuing the Rowing from Home to Home journey. I cycled 1,300km down the east coast of Australia to a new launching spot where I will make a second attempt to finish the expedition by rowing solo across the Tasman Sea later this year. All things must come to an end and I am determined in one way or another to finish the expedition in the next few months. I am keeping my exact plans as low key as possible due to factors which one day may be explained in the expedition book. Many strategic decisions are being made for the better good of the expedition. The cycle ride in Australia was some of the most enjoyable and beautiful riding I have done, anywhere in the world. Attached is some photo’s taken by expedition film producer Alistair Harding. Leaving the town of Ballina and the big prawn – Ballina is well known for its prawn fishing industry. I spent an enjoyable evening hosted by Scott and Sarah Donaldson in Coff’s Harbour just before Scott departed on his attempt to kayak the Tasman solo, here is his kayak. Cycling over the Sydney Harbour Bridge was a surreal and incredibly rewarding feeling which I will never forget. Some 10,500km and 150_+ days of travel since leaving Singapore completely by human power. After 5,300km of cycling through Australia, I found my favorite part of the country to be the south east coast – rugged, raw, windswept, beautiful. I will very shortly be continuing the ‘Rowing from Home’ to Home journey. Back on my bicycle I will head south from the town of Ballina where I landed in the boat last year, in search of a new launching spot. I can’t wait to be out and about again, and its a great opportunity to trial an idea I had whilst plodding across the Australian outback into headwinds day after day after day. With plenty of time to think, I wondered just how light I could go with my cycle touring set-up. As you see I carry no cooking gear and will just eat cold and dry food in between towns. The east coast of Australia is heavily populated and very different to the outback of Australia. Next post from the road! As I prepare for round two of the Tasman Sea crossing I am spending my time revamping my complete speaking business. I am very excited to release this to you all within the next two weeks. January has been a wonderful month for speaking with five events and a brand new series of keynotes and new material which I am loving presenting! Next week I will be speaking in Hong Kong for the team from Lightfoot Travel, this is open to all! You just need to register as per the instructions on the flyer attached. If you are in Hong Kong I would love to see you there! One of the most important techniques I use after a ‘failure’ is to sit down and write down what I would do differently. It’s important to do this as timely as possible while its still fresh in my mind. I find the process both cathartic, insightful and most importantly a great tool for DECISION MAKING. And the biggest decision is: ‘Do I want to try again?’. I went through this process after an unsuccessful attempt on Mt Everest in 2011, it helped me work through from a confused state of mind to a firm conclusion that I was going back and I knew exactly in what style and what I needed to change to be successful. I am now working through the process together with the Rowing from Home to Home team. I am neither depressed, dis-heartened, disillusioned or scared off after the last 24 day attempt. Overall it was an incredible experience challenging myself in an environment and a style that I love. I lived more in 24 days that I have from 20 years working in the corporate world. Attached is a sequence of photographs taken from the most interesting day – day 13, when things started to become interesting. I rose at 0530hrs and decided to retrieve the sea anchor and attempt to row. The sea state was confused after 20 – 25 knots of northerly winds building up for over 48 hours. Shortly after this photo I had to swim to the bow to re-fix a new para anchor line. Later that evening the wind changed to the south and rose to over 40 knots and the sea became very rough as the wind was now directly against the waves. This is when we eventually capsized. The boat and myself were still well within our safe operating parameters and designed to weather worse conditions however I believe the photo gives those at home a clearer idea at least of what a ‘normal day’ on the Tasman can feel like! Step One: Always keep a lookout while working on deck – oops, somethings coming! 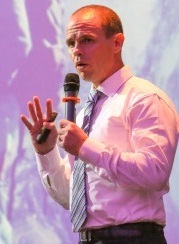 Inspiring Keynote Speaking – open again for bookings! Now I am off the water, I am open for bookings again for keynote speaking events! 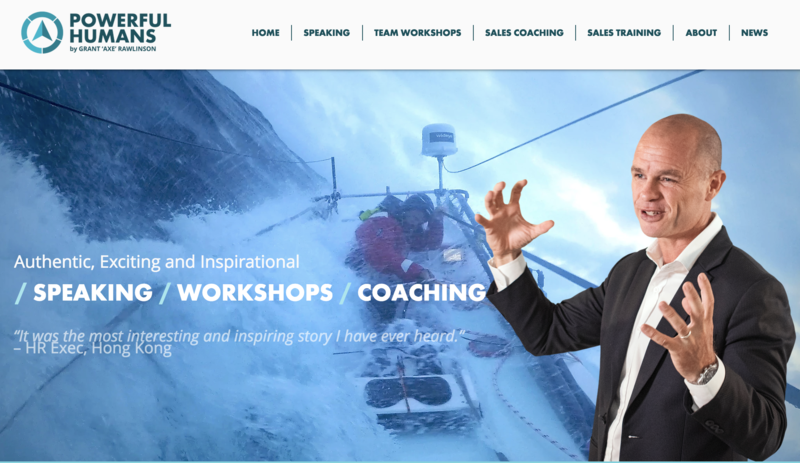 For your conference’s, customer appreciation evenings, seminars, workshops, after dinner, schools, team building, you name it, if you are looking for a fresh, recent, relevant, real and inspiring story told by a professional speaker then please get in touch! What behavioral changes (if any) are you trying to influence your team through this event? Are you also holding a workshop during your event? What are the dates for your meeting? Are these confirmed? What is the location of your meeting? Yesterday (Saturday 11 November) around 1400hrs I switched off the GPS tracker and stepped ashore at the small port of Ballina in Northern New South Wales. 24 days and 1,100nm after departing Coff’s Harbour. These guys are all volunteers and do a wonderful job protecting the people in the water 24 hours per day/7 days a week. I am looking forward to donating to their organisation. I have been through a lifetime of emotions and experiences in the last 24 days. Without a doubt it was the toughest 24 days of my life. We rowed through shipping lanes and were surrounded by steel giants travelling at 15 knots, making me sick with fear, night after night. We were capsized, smashed by waves, visited by sharks, dolphins and sea birds and pushed around by the invisible but supreme forces of wind and current. I was pushed and tested to the extreme in mother natures ultimate arena. This is one of the reasons I take on these journeys. My emotions rolled with the swells, often on an hourly basis from the depths of despair to highs of hope. The Tasman showed me she is a merciless bully, she is violent and cruel, unforgiving and waiting to expose any weakness she can find. I have new felt respect for her that can only be earned from direct experience. For the last 8 days my complete focus was on getting back safely to shore, together with the boat. The last three nights I had little sleep. The last evening I did not sleep as we crossed the shipping lanes. But we made it to shore, yes we are not in New Zealand, but from the jaws of defeat we salvaged some victory. Simpson’s Donkey is bruised and bleeding but still a beautifully seaworthy little craft. We have hope again. The expedition has hope. This final stage is much more than just trying to cross the Tasman. It is the culmination of a dream, of years of effort, commitment and sacrifice. It is the grand finale of 147 days and almost 10,000km of travel completely by human power since departing Singapore on January 3, 2017. Roger ‘Clouds Badham expedition meteorologist. I spoke to Clouds every day, often twice/three times per day as we tried to work our way through a very complex set of wind/current/rowing dynamics. He could let me know down to the hour when I would be smashed by winds from different directions. On the final evening he stayed up all night with me, updating me through the night. He never gave up and without him I would never have made it back to Australia with the boat. He always referred to what was happening in the boat as what ‘we’ were doing. He made me feel he was with me in the boat. Dave Field – expedition project manager – managing an expedition like this is not easy, especially when its going wrong. I spoke to Dave every day and often vented my frustrations towards him. He coordinated so much in the background, so professionally and gave me the reassurance he was always on watch. I am forever indebted. Coffs Harbour Customs – Thanks to Dean Pascoe and colleague for travelling all the way to Ballina to process me back into Australia. What a gentlemen and an ambassador for his organisation and to the goodness of Australian people. Stephanie – My wife. Sorry for not being at home during difficult times, thank you again for holding the fort and being there in spirit when I needed it. I will be home soon. Alistair Harding – Film producer – as all year long, once again Alistair had made the huge last minute effort to get to the landing site, once again I saw his tiny drone in the sky as we approached the safety of land. Alistair, this expedition is your journey as much as it is mine. AIS gone down right when I needed it to cross shipping lane. No sleep then this eve, on watch all night.Tomorrow hope to be very close to land for tow in. Currently 48nm to shore. 90nm to Coffs Harbour & searching for South current. Crew happy, rowing since 0600, tea N hash brown for bfast. looking forward to a beer.